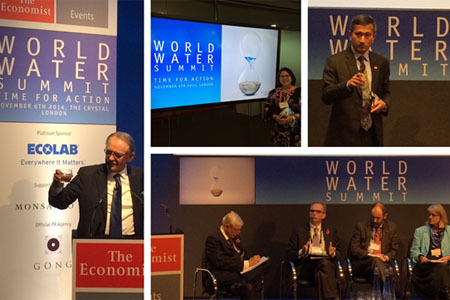 On Thursday, November 6, I attended The Economist's 2014 World Water Summit, where the world's leading thinkers on water policy, management, irrigation, technology, economic development, sanitation and hygiene and water-related risks gathered in London to catalyze action in response to the looming global water crisis. Driven by the event theme – Time for Action – speakers from the private sector, government, academia, and associations provided the rationale and recommendations for pushing progress to a new level, stimulating private sector involvement and smart partnerships, and raising the profile of and activity supporting water stewardship across all sectors of society. John Parker, who writes on global trends in the environment for The Economist, moderated the summit, which was held in London's The Crystal, a world-class LEED and BREEAM-accredited building and home to the sustainable cities initiative by Siemen's exploring how sustainable technologies can shape the future of cities. The event kicked off with a video message by Prince Charles, who reminded attendees about the importance of sustainable water management, accepting responsibility for and properly managing water, and measuring what matters. He stressed that the sector should move toward "enlightened water diplomacy" and "fair pricing regimes." He also noted that we must understand that because water lies at the heart of increasing population, energy use, and demands on food, it is "not a simple equation to balance." Jan Eliasson, UN deputy secretary-general and keynote speaker for the Summit, shared details of the changing and more dangerous global water landscape: surges in water-related crisis, mounting demographic and unsustainable economic pressures affecting water quality and quantity, and a world where sanitation for all is still a major challenge. Eliasson noted that tensions over water and lack of access to water are escalating, fuel conflict, and threaten peace and security. "Degraded access to water as a result of climate change, or population pressures, risks creating social tensions, political instability and intensified refugee flows. Even more disturbing is when we see this resource used as a weapon of war," he said. He added that the potential for shared management of water as a means to achieve regional cooperation and conflict prevention is vital and recommended that the sector step-up efforts in hydro-diplomacy and use water as a source of cooperation rather than as a source of conflict. Eliasson closed his presentation by saying: "We need leadership in the spirit of engaged and compassionate national and global citizenship. Let there be no more deferring of difficult decisions. 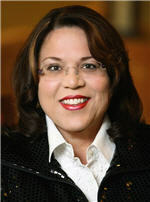 We must not saddle future generations with problems we can solve today." The Economist Events is the leading provider of international forearms for senior executive seeking new insights into strategic issues these meetings include industry conferences management events and government roundtables held around the world. Accredited business communicator, water communication expert, and counsel to CEOs, scientists, engineers and professional communicators, Donna delivers holistic, value-based and industry-relevant solutions and results. Donna is actively engaged with global water leaders at highest levels of business, government, associations, and international organizations. She is a multipotentialite, a fan of Einstein, and an avid environment and nature photographer who frequently writes about water issues.